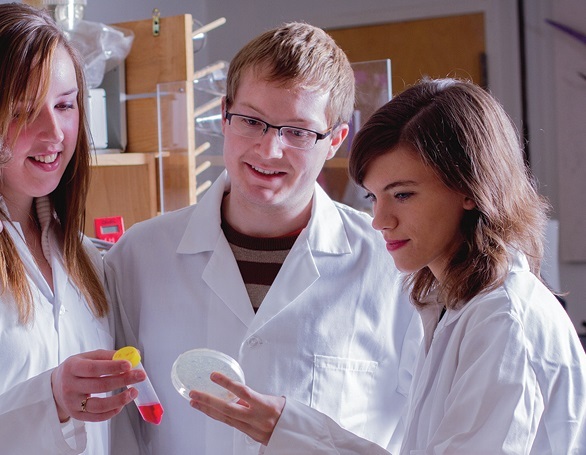 The University of Lethbridge recently received $1.5M in funding from the Government of Canada through Western Economic Diversification to enable the creation of a supervised maker-space in synthetic biology, the first of its kind in Canada. The maker-space will empower interested students, graduates, post-doctorate students and faculty to explore their creativity and ideas by providing access to infrastructure that otherwise would not be available to them. This is particularly important for the nascent entrepreneurial-minded bio-engineers in Lethbridge that will have access to tools allowing them to efficiently perform the design-build-test cycle that bring their ideas to the proof-of-principle stage. It will help to reduce the otherwise often insurmountable technology and financial barriers to bring their synthetic biology / bio-engineering ideas to the point where commercialization is possible. Synthetic biology is an emerging discipline at the confluence of engineering and molecular life sciences. It has huge potential for both the next generation of life science researchers as well as the emerging bio-economy. Successful applications range from the production of bioactive compounds, such as medications and fragrances that are higher quality with lower environmental impact, to bio-remediation and sensor construction. Potential applications of developed and engineered technologies are everywhere, including farming (e.g., crop protection), medical (e.g., novel personalized therapies) or space exploration (e.g., sustainable production of materials). The uses and designs are probably only limited by our own imagination. Research indicates that synthetic biology is an exponential-growth technology sector predicted to permeate our everyday lives, similar to what we have experience with computers and the internet. We are currently just beginning to experience the effects of this development. The SynBridge maker-space will be part of the experiential learning ecosystem at the University of Lethbridge. It will be supported by the University of Lethbridge’s newly-established entrepreneurship and innovation program, AGILITY. The AGILITY program is a visionary initiative centered on experiential learning opportunities. One of the pillars of AGILITY is to build on the success of our students and faculty in the commercialization of research outcomes. Since the SynBridge maker-space is being overseen and operated by the Alberta RNA Research and Training Institute (ARRTI), faculty can provide opportunities for students to learn technical skills. Building on a strong entrepreneurial culture cultivated by successful start-up companies and access to entrepreneurial expertise through AGILITY, the SynBridge maker-space will promote entrepreneurship from project inception to company incorporation. Ultimately, through a hands-on approach and integration with the research and iGEM teams at the U of L, the synthetic biology/bioengineering maker-space will offer participants practical, experience-based learning opportunities where they can explore self-employment, apply learning and gain confidence as part of workshops or project based bioengineering assignments. The state-of-the-art infrastructure and expertise will be available as a for-fee service to local companies, engaging them with the maker-space and the trainees in it. The SynBridge maker-space will build a stronger entrepreneurial culture in the life sciences through the infusion of engineering views and approaches.